Marysville’s Cassidy Francisco (42) shoots a jumper Tuesday evening at Hilliard Davidson. Francisco led the Lady Monarchs with seven points during a 43-30 loss. There are times that even during a loss, a coach can find bright spots about his or her team. That’s how Marysville High School girls basketball boss Brooke Young looked at Tuesday’s 43-30 setback at Hilliard Davidson. “I thought we took a lot of good steps tonight,” said Young. “The last game (Thursday’s 55-35 loss to Hilliard Darby), we played scared and that left a bad taste in our mouths. Young particularly singled out the defensive work of Haley Cook. While Young was pleased with the team’s defensive effort, there were a couple of areas that still need work… namely eliminating turnovers and improving on the boards. Marysville (1-2) played the game without starting point guard Sydney Lee, who is nursing an ankle injury. “Sydney should be back on Friday when we play at Westland,” said Young. Without Lee on the court, the Lady Monarchs had difficulty getting into an offensive flow. The turnovers resulted in a number of empty possessions. Young said Marysville also still needs work on rebounding, which was a concern going into the season. “We’re still standing around a lot,” she said. The Lady Monarchs’ offensive struggles were particularly evident during the opening period against a 1-2-2 zone defense that kept them from taking the ball into the lane. Many of their possessions ended with nothing to show as a result of errant shots or turnovers. The clock reached 3:39 before Marysville tallied its first point on a free throw by Kassidy Lee. The Wildcats took a 12-1 advantage when Grace Royer drained a long three-pointer. The Lady Monarchs were held without a field goal during the first eight minutes as their final points of the stanza came on a couple of charity tosses from Cassidy Francisco. Davidson held a 14-1 lead when Francisco made a spin move along the baseline and drew a foul as the clock reached zero. She hit both free throws to end the period. Marysville’s offensive woes continued during the second quarter. Maddi Colopy’s trifecta was MHS’ first field goal of the game. The Lady Monarchs, however, didn’t score again until Lee’s basket made just the slightest dent in the Wildcats’ advantage that had climbed to 25-6. Logan Brown tallied a traditional three-point play with 31 ticks on the clock as Davidson took a 27-11 lead into the turn. Tinley Graves gave MHS’ offense a bit of a spark during the third set when she buried a pair of three-pointers. Royer and Simon, however, matched Graves’ offerings as Davidson’s margin reached 20 at 39-19. 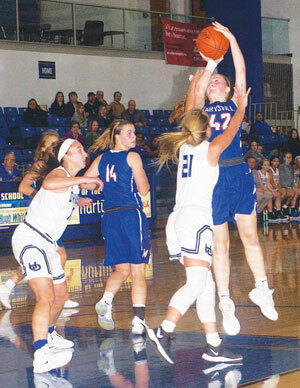 Cook found the range from beyond the arc and Caitlin Cotner went past a defender for a basket that cut Marysville’s deficit to 39-24 by the end of the third period. Francisco sank a trio of charity tosses as part of her team-high seven points during the opening minutes of the fourth quarter. Her second and third free throws narrowed the gap to 39-27 with 5:59 to play in the game. That’s as close at the Lady Monarchs got the rest of the way. A stickback from Royer stretched Davidson’s lead to 43-27 as the timer neared the four-minute mark. There wasn’t much in the way of offense for the remainder of the game. Lee connected on a free throw and Brown hit a basket to pull Marysville to within 43-30. The Wildcats, though, did a nice job of controlling the clock on several possessions down the stretch to end the game. Simon 5-2-13, Dixon 4-2-11, Royer 2-0-5, Ryan 1-2-4, O’Connor 1-1-4, Kaufman 2-0-4, Peterson 1-0-2, Brooker 0-0-0, Sell 0-0-0. Totals 16-7-43. Three-point goals: Simon 1, Dixon 1, Royer 1, O’Connor 1. Francisco 1-5-7, Graves 2-0-6, Brown 2-1-5, K. Lee 1-2-4, Cook 1-0-3, Colopy 1-0-3, Cotner 1-0-2, Daniel 0-0-0, Sutter 0-0-0. Totals 9-8-30. Three-point goals: Graves 2, Cook 1, Colopy 1.